The design booklet is written for an intermediate level embroiderer who is interested in learning basic Hardanger and working Rhodes stitch patterns. Hardanger satin stitches, four-sided kloster blocks, Rhodes stitch patterns and the ribbed spider web flower are discussed within this booklet. 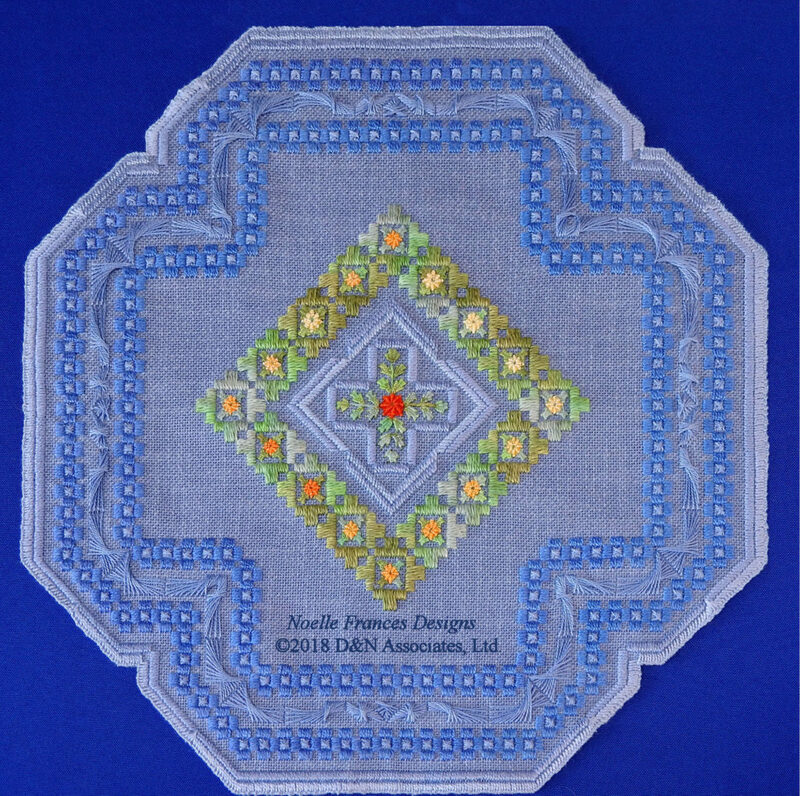 Expanded discussion of embroidery and Hardanger information is available on the pages of this blog. My booklets are divided into sections that discuss the main pattern parts of each design, present photos and graphed charts in full color close-ups so you can see the details. Within the e-book format you can expand the charts and photos throughout the booklet to view details down to individual stitches. There is no cut (open) work within this design though cutwork can be added to the four-sided kloster blocks within the border area. For cutwork discussions and photos, view my page hardanger cut openwork within this blog. Fiesta Flowers is a Hardanger design that can be finished as a table or cabinet top display mat by snipping off excess fabric along the outer buttonhole worked edge or matted and framed for wall display. Fiesta Flowers design count is 293 by 293. Work area is approximately 13.5-inches square on 22 count fabric.